Like many other retirees who woke up on a balmy June morning this year, Bob Jones went for a swim. He had been preparing for this particular swim for more than a year, and he had flown from Hartsburg, Mo. to California, just to dip his toes and the rest of his body into the San Francisco Bay. A ferry carried him from San Francisco to the edge of the east side of Alcatraz island. The San Francisco Bay is known for its choppy waters and strong currents. 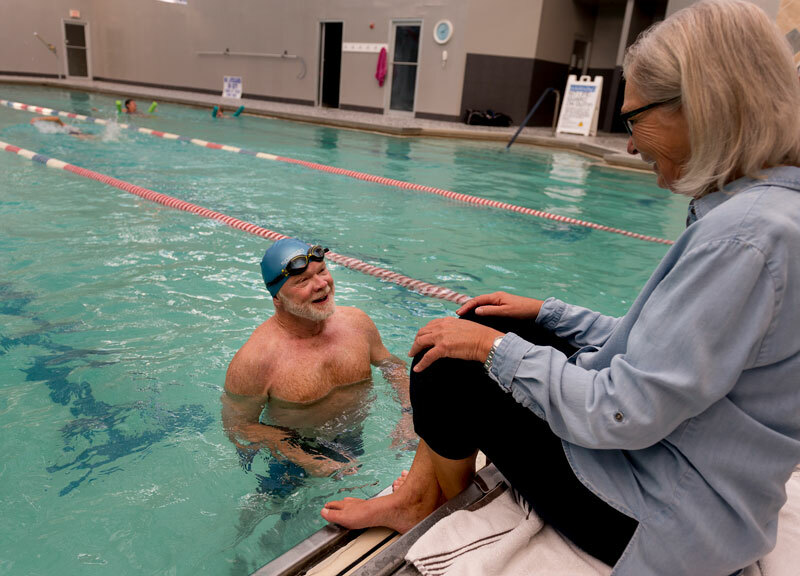 Bob, who is 71 years old and lives with his wife Kathy in the country outside of Hartsburg, knows he is a strong swimmer, but as he jumped off the ferry and into the 57-degree waters of the bay, he wondered what he had gotten himself into. Although he was wearing a wet suit as protection from the chilling waters and had trained diligently, he had his doubts. “It’s a weird feeling. It’s like you’re shipwrecked and you’re out there in the water with all these other people. You try to do your proper swimming form, but the waves are so strong,“ he says. Nearly 800 other swimmers were in the water with him, competing in the Alcatraz Sharkfest Swim. The distance from Alcatraz Island to the San Francisco Aquatic Area is one and-a-half mile. Swimmers who miscalculate the strength of the current or who lose sight of landmarks are rescued by kayaker/lifeguards before the ebb tide can catch them and sweep them away from shore. While Bob stroked his way across the bay, taking in an occasional mouthful of salty water, Kathy was eating breakfast with a friend at a restaurant near Fisherman’s Wharf. Although Kathy has had plenty of experience serving as Bob’s safety watcher, sitting on the side of Hulen Lake or at the Finger Lakes State Park while he practiced open-water swimming, she didn’t watch him this day. “I was really too nervous,” she says. About five minutes before the first swimmers reached the shore, she and her friend went down to the water’s edge. The swim across the bay didn’t last as long as most of Bob’s practice sessions. Forty-seven minutes and 46 seconds after entering the water, Bob emerged safely from the bay. Later, he found out that he had finished second in his age group, missing first place by a mere 30 seconds. “When I got done, I thought ‘I’ll never do this again.’ Then after a while I thought ‘I bet I can do better next time.’ So, I signed up for the June 2018 swim,” he says. To prepare for that next race, Bob will continue his regime of tough swimming workouts four times a week while following the advice of his swimming coach, Cesar Mello. A typical workout lasts an hour to an hour and-a-half – enough time to swim about 70 laps of the pool at Wilson’s Fitness Center. While Bob swims his laps, Kathy usually works out at the gym. Years ago, in Hannibal, she was part of a group that ran with Bob as he prepared for marathons. Now, though, after some health issues, she has shifted to less strenuous workouts of her own. Of course, Kathy has more facets to her personality and life than supporting her husband’s love of sports and competitions. Still, it’s difficult to upstage a guy who celebrated his 60th birthday by swimming across the Mississippi River from Hannibal to the Illinois side. Or who has run in 11 marathons and some triathlons; has skied in Innsbruck, Austria; has bobsledded in Lillehammer, Norway; has paraglided; likes canoeing and biking; and who is planning a kayak journey from Jefferson City to St. Charles with his 13-year-old grandson. Bob and Kathy are both retired – sort of. Neither of them have fulltime positions, which allows them time to spend with their kids and grandkids, time for friends, and time for their wide range of interests. As well, they make time in their busy schedules to help others. Kathy currently works a couple days a week as a substitute medical social worker for St. Mary’s Hospital in Jefferson City. Bob, who is a dentist, had a general dentistry practice for 35 years in Hannibal. He loved his small-town practice and considered his staff family. As for his patients, he knew them as friends and neighbors, and even knew the names of their dogs as well. After moving with Kathy to mid-Missouri about eight years ago, he realized that he didn’t want his skills as a dentist to get rusty and fade away. And he wanted to do something for people who might otherwise not ever receive good dental care. He now works two days a week at Mid Missouri Dental Center in Columbia, treating up to 40 low-income children a day. Dentist Mike Todd, co-owner of the Dental Center, is impressed with the skills and spirit Bob brings to his practice. “When Bob first came to us, he wanted to give something back to the community. We weren’t open on Fridays, and we said the office is available if you want to come in and work. Since then, he’s picked up a second day and is now an integral part of our practice,” Todd says. What would make a dentist put down his drill and mouth mirror at the office and head out for a swim across the San Francisco Bay? Coach Mello knows the answer to that question, “He likes to challenge himself. He had done marathons and triathlons and he wanted a new challenge,” Mello says. “He’s in great shape – he looks like he’s 50,” he adds. Bob also challenges himself artistically. In addition to enjoying photography, he’s a sculptor whose work has been displayed at the Central Bank of Boone County’s art contest. He has a studio in his home, where he molds clay and works on stained-glass windows. “It’s such a peaceful thing to do,” Bob says. One of his stained-glass projects took a year to complete and now hangs high on a wall of west-facing windows in their living room. Another, a bright yellow sunflower, hangs in the kitchen. The windows of their home are a perfect setting for his stained-glass art. The house, which sits on the top of a hilly 15 acres, was built to take full advantage of the panoramic view of the hills rising above the Missouri River. From their back porch, Kathy and Bob can see landmarks in Jefferson City, California and Jamestown. Their backyard includes a two-level tree house that juts into a wooded area. “We say it’s for the kids but we are the ones who go up there and sit,” Bob says. Below the tree house is a patch of ground that the couple has cleared and replanted with native grasses and wildflowers. Hiking trails wind through their acreage, and a small orchard bears peaches and other fruits just steps from their driveway. On most Sundays, Bob and Kathy have their children and grandchildren over for dinner. It’s not unusual for a group of 10 or 11 family members to help prepare the meal. It would be easy to live in such an idyllic setting – surrounded by family, nature and art – and to forget that not everyone in mid-Missouri is as fortunate. Bob and Kathy make a point of not forgetting. On Saturdays, they cook and serve meals to the homeless and low-income people in Columbia when it’s their church’s turn to staff the Saturday Breakfast Café. During winter months, they both volunteer at Room at the Inn, and on some Saturdays, Bob is part of a group that fixes up yards and does minor home repairs for seniors. In some ways, Bob and Kathy are opposites that attract. Kathy is more reserved, while Bob is gregarious. Kathy’s work as a social worker depends on relationship building; Bob’s dentistry relies on the skill of his hands, coupled with knowledge and experience. But they share a common enjoyment of family and friends. Coach Mello, who has worked with Bob intimately for more than a year, sees Bob and Kathy as a team. “Kathy is with him at every single outdoors practice, watching as a safety, timing him and taking pictures. She plays a big role,” he explains.